The gun will allow you to shoot up to 5 darts per second, raining down fire and destruction on your poor colleagues with their inferior weapons. The 25-dart drum will provide you with the opportunity to shoot every one of your competitors before running out of ammo. Requires batteries that aren't included in the package. 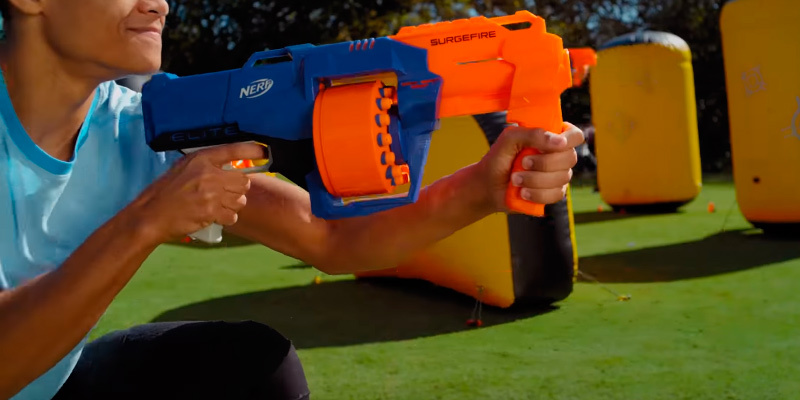 If you're tired of drawing the short end of the stick every time you have a Nerf War session in the office, you owe it to yourself to give the Nerf N-Strike Elite HyperFire Blaster a try. Though the product is a bit on the expensive side, you can't really put a price on victory, can you? The Zombie Strike darts look a hell of a lot cooler than average darts. The toy makes it easy to recharge the blaster without drawing out the drum. Since this is a one-handed blaster, any kid above the age of eight should be able to handle the pistol with relative ease. The effective range of the gun tends to shorten after some time. We would recommend one of these Zombie Strike Nerf Guns to the type of customers who'd be able to appreciate the thought that was put into the model's design. 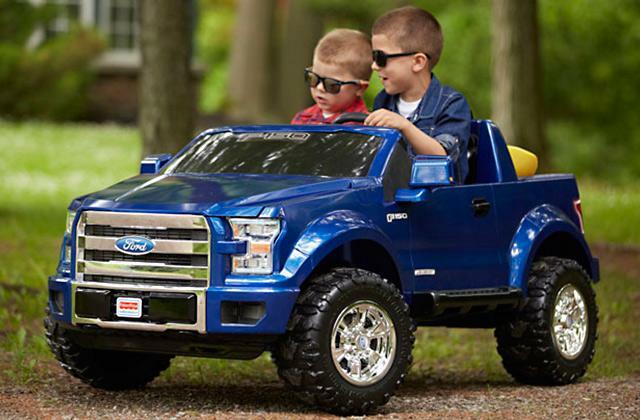 It isn't the best option for adults but a great toy for kids who are looking to give hordes of imaginary zombies a run for their money. The manufacturers amped up the velocity of the model, meaning that the gun does a far better job when it comes to maintaining accuracy and flight stability at the extended distances, especially compared to the previous iteration of this model. The Slam Fire slide will allow you to blast as fast as you can fire. The gun still lacks in terms of accuracy. 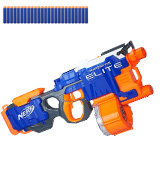 Nerf Official N-Strike Elite Strongarm Blaster will prove to be a great choice for those people who have fallen in love with the classic Nerf Blaster design over the years but would like to improve their fighting prowess with increased mobility and speed. On top of the base of the blaster, you'll get 3 interchangeable components: stock, assault grip, and barrel extension. By removing and attaching those components, you'll be able to customize the model according to your needs and preferences. 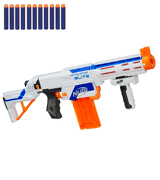 The Quick-Reload structure of the clip makes this weapon the second fastest firing Nerf gun. The darts get stuck in the chamber from time to time. 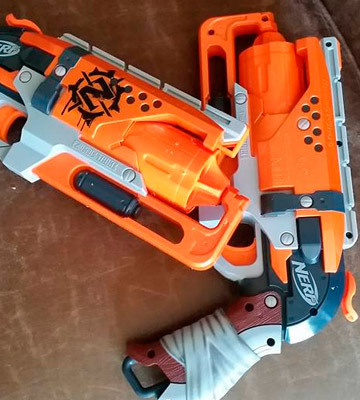 Nerf N-Strike Elite Retaliator is easily the best option from Hasbro when it comes to versatility. Whether you prefer to shoot from the hip or like to feel the weight of the weapon in your hands, this is a gun for you. 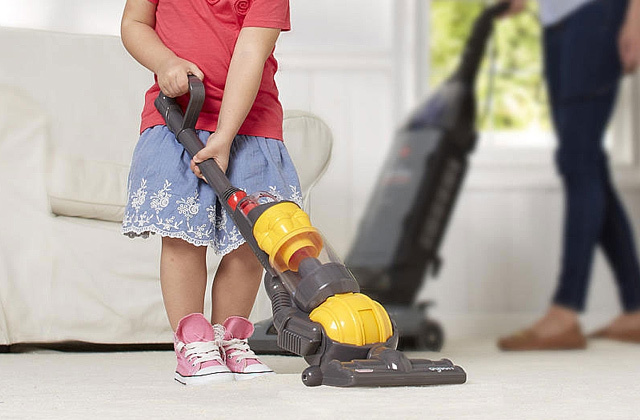 The rotating drum is capable of storing up to 15 darts, making it one of the highest capacity models from Hasbro. The 90-feet effective range of the gun will allow you to snipe your opponents from a particularly long range. You can blast 1 dart a time or rapidly slam-fire all 15 darts. The darts may leave bruises. 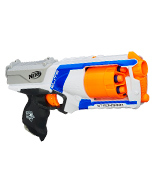 There are a lot of things that make this Nerf gun such an attractive option for a number of different groups of people. Of course, the fact that this is the most powerful mechanical foam dart blaster doesn't hurt and neither does its long range. 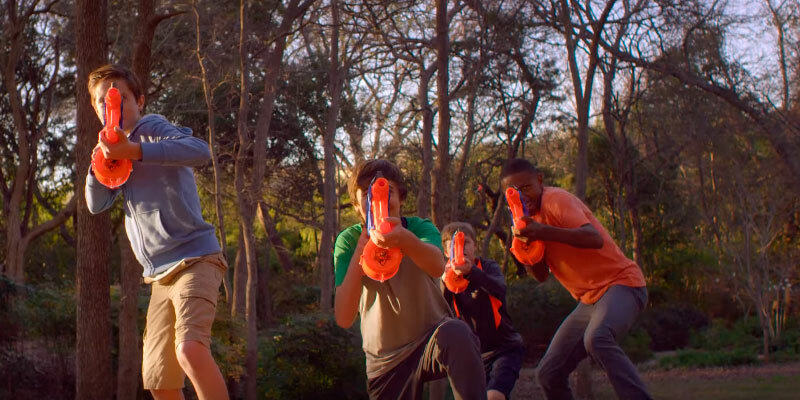 The so-called Nerf Wars may not necessarily have that much in common with the actual war and we can't say that it is a bad thing. That said, there's nothing wrong with taking this silly little competition a tad more serious than the rest of your coworkers. 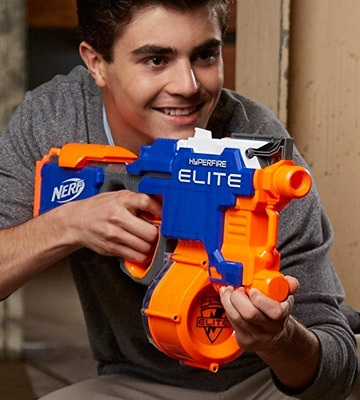 So, next time you decide to have a round of Nerf Wars in the office, whip out the Nerf N-Strike Elite HyperFire Blaster and show everybody who is the boss. 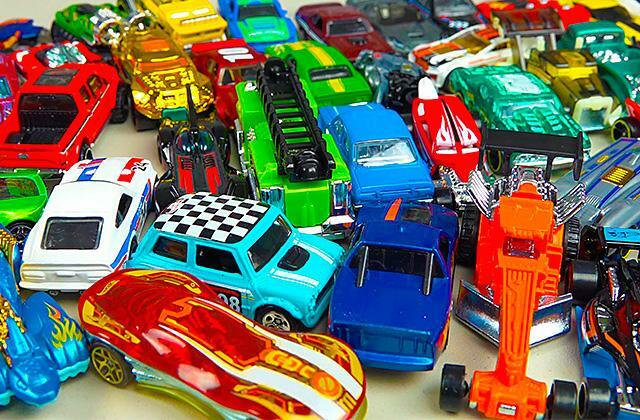 Of course, you may be under the impression that most of these toys do not differ that much from each other, but that isn't the case here. Where the majority of Nerf Blasters feature a mechanical setup, these Nerf Elite guns come equipped with a motorized dart blasting system. Unfortunately, the motor requires batteries to run, which is really the only downside of this model. But as long as you have a full set of fresh batteries, the gun will allow you to shoot up to 5 darts per second, raining down fire and destruction on your poor colleagues with their inferior weapons. Naturally, you might think that this sort of rate of fire will leave you with an empty clip in less than a second. But the manufacturers have thought it through and made sure to implement a 25-dart drum into the model. Of course, you can also buy this toy for your kid, as long as he or she is above the age of 8, but we wouldn't recommend wasting the most powerful Nerf gun on your offspring. 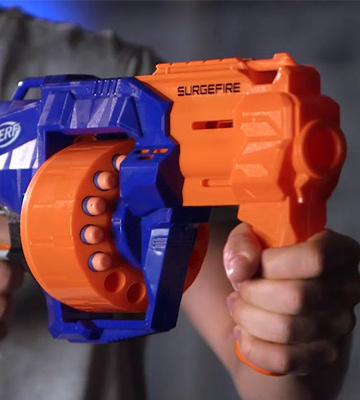 All in all, if you're tired of drawing the short end of the stick every time you have a Nerf War session in the office, you owe it to yourself to give the Nerf N-Strike Elite HyperFire Blaster a try. Though the product is a bit on the expensive side, you can't really put a price on victory, can you? Nerf Zombie Strike Hammershot Blaster is a model for kids and adults who don't just like to have some fun but also care about the visual side of their toys. It isn't necessarily the most effective Nerf Blaster out there but it is certainly one of the best-looking ones. That said, what you initially receive is more or less your typical Nerf pistol. However, in addition to the standard instruction manual and the 5 Zombie Strike darts, you will also get a set of Zombie Strike stencils. Using the latter, you will be able to make the weapon that belongs in the zombie apocalypse setting like no other toy. Naturally, you can use the blaster yourself, or you can give it to your kid and let him have his pretend battles against a horde of insatiable zombies. Since this is a one-handed blaster, any kid above the age of eight should be able to handle this pistol with relative ease. And given that this is Hasbro we're talking about, the quality of materials, as well as their safety, come without question. Though the effective range of the weapon is relatively limited, it shouldn't prove to be insufficient for a young zombie apocalypse survivor who is just looking to have some fun. To rephrase our earlier point, we would recommend one of these Zombie Strike Nerf Guns to the type of customers who'd be able to appreciate the thought that was put into the model's design. 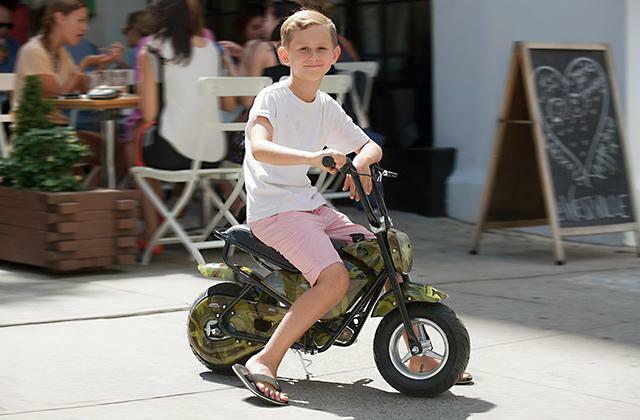 It isn't the best option for adults but a great toy for kids who are looking to give hordes of imaginary zombies a run for their money. 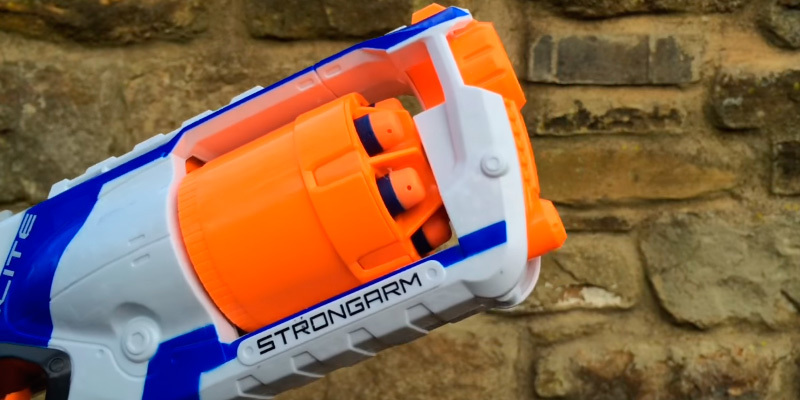 Nerf Official N-Strike Elite Strongarm Blaster presents a new take on the classic Nerf Blaster design that so many people have fallen in love with over the past couple of decades. It doesn't necessarily bring anything new to the table but the team of experts at Hasbro made sure to improve every aspect of the blaster in order to make it a much more effective weapon in the pretend wars to come. First off, these experts have made sure to amp up the velocity of the model, meaning that the gun does a far better job when it comes to maintaining accuracy and flight stability at the extended distances. That said, some users still remark that these Nerf N Strike Guns lack accuracy, so make of that what you will. However, what the customers certainly do not complain about is the effective range of the blaster, capable of firing up darts up to 75 feet. The rotating barrel of the gun holds up to 6 darts and the Slam Fire slide will allow you to blast as fast as you can fire. Plus, what makes this gun so effective isn't just that it fires darts at an impressive rate but also the fact that it doesn't take a lot of time to reload, providing you with the sort of mobility and speed that will give you a solid competitive edge over your opponents. 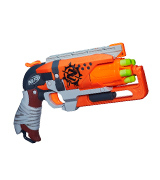 In conclusion, Nerf Official N-Strike Elite Strongarm Blaster will prove to be a great choice for those people who have fallen in love with the classic Nerf Blaster design over the years but would like to improve their fighting prowess with increased mobility and speed. When the time for talk comes to an end and the time for action ensues, you'll want to be prepared for anything that your opponents may throw your way. 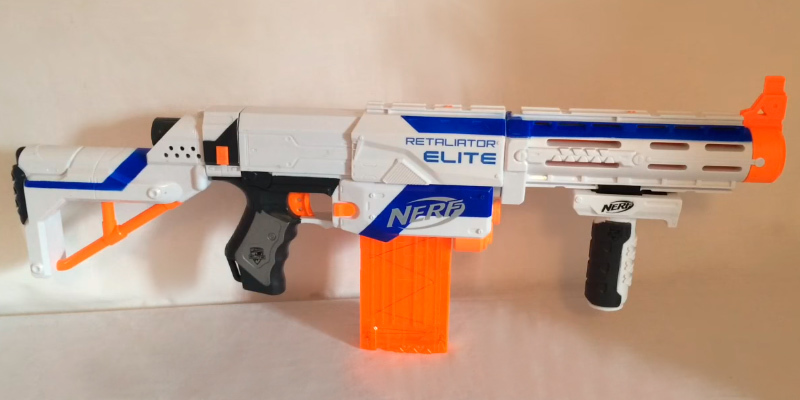 And with this Elite Retaliator Blaster, you will be. 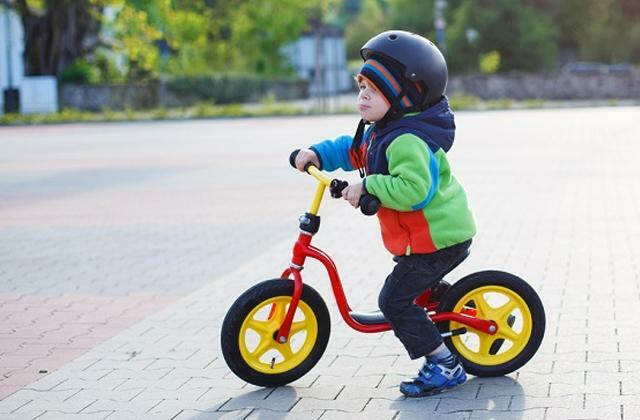 Instead of one of those run-of-the-mill Nerf guns for boys and girls, you will receive a versatile and a powerful weapon that you can modify however you want. In addition to the base of the blaster, you'll get 3 interchangeable components: stock, assault grip, and barrel extension. 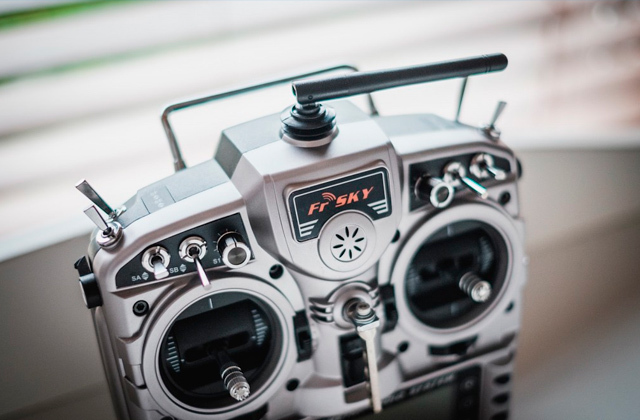 By removing and attaching those components or simply shuffling them around, you'll be able to customize the model according to your needs and preferences. Setting the versatility aside, the product in question isn't the one to disappoint in terms of performance either. A 12-dart clip will allow you to store more darts than the majority of foam dart blasters. 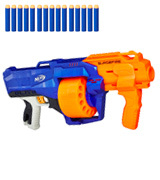 On top of that, the Quick-Reload structure of the clip makes this weapon probably the second fastest firing Nerf gun. Of course, the downside of that speed is that the darts tend to get stuck in the chamber from time to time, so no need to go into the panic mode if your gun suddenly stops firing. And since the product offers 4 configuration options, the folks at Hasbro made sure to include an instruction manual that will help anybody figure the whole thing out. 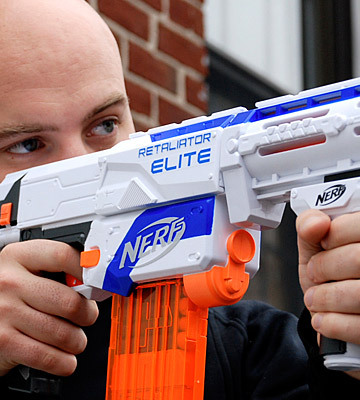 In short, Nerf N-Strike Elite Retaliator is easily the best option from Hasbro when it comes to versatility. Whether you prefer to shoot from the hip or like to feel the weight of the weapon in your hands, this is a gun for you. 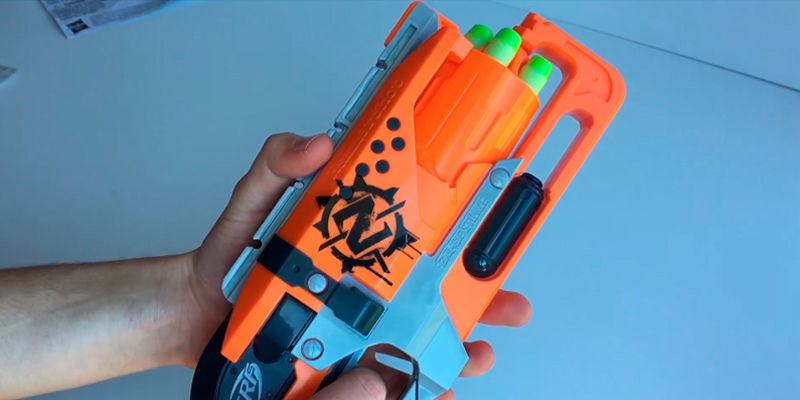 Aside from the monstrosity that is the Nerf B5573, what we have here is arguably the strongest Nerf gun on the market that doesn't require batteries to run. 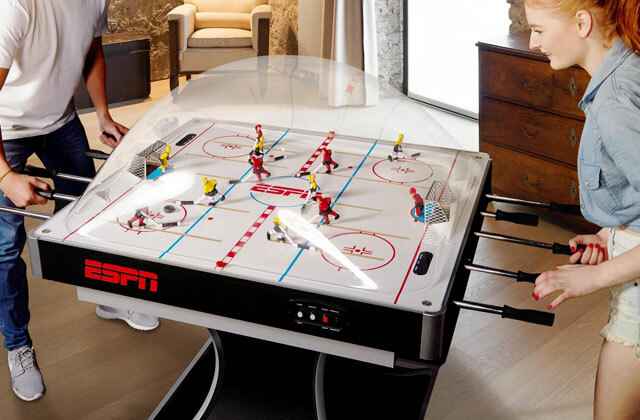 In fact, the model is so powerful that we certainly wouldn't recommend it to kids below the age of 10 as the darts tend to leave bruises behind when they hit the intended target. That said, aside from being the hardest shooting mechanical gun, the toy actually has quite a lot to offer for all kinds of customers. For instance, the rotating drum is capable of storing up to 15 darts, meaning that this is also one of the highest capacity models from Hasbro. With so many "bullets" in the "magazine", you will be able to last longer than the absolute majority of your opponents, and that is exactly the kind of competitive edge that will allow you to prevail in the Nerf Wars to come. Furthermore, while your opponents are running around trying to shoot you with regular Nerf guns, you will be able to snipe them from a 90 feet distance. The effective range and the capacity of the drum will allow you to take control of the battlefield. Choose any target you want and blast 1 dart a time. And if that doesn't work, rapidly slam-fire all 15 darts to make your friends and colleagues regret they ever challenged you to a Nerf War session. In all, there are a lot of things that make this Nerf gun such an attractive option for a number of different groups of people. Of course, the fact that this is the most powerful mechanical foam dart blaster doesn't hurt and neither does its long range. Whether you're a person that is far removed from the world of toys and casual office entertainment or you're the type of individual that is really fascinated by all that stuff, there's a good chance you have heard of Nerf guns before. 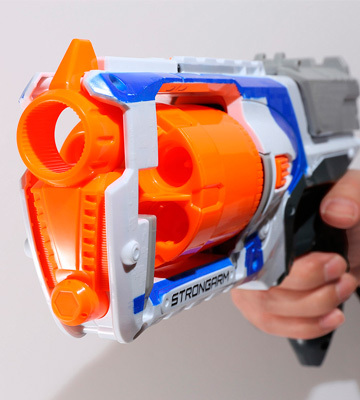 These toys from Hasbro have gained such popularity that "Nerf gun" has managed to become a blanket term for any foam dart blaster, even if it wasn't produced and manufactured by Hasbro under the Nerf brand name. And if you look at it from a more general perspective, there's really nothing particularly surprising about their success. 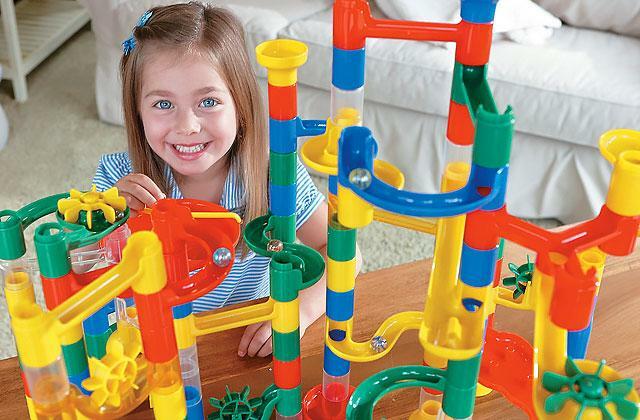 These toys aren't just perfectly suitable for kids but they also make a good distraction for adults who are looking to have some fun after a tiresome day at the office. Most of these guns tend to fall under a couple of categories that separate the one-handed blasters from the two-handed ones. 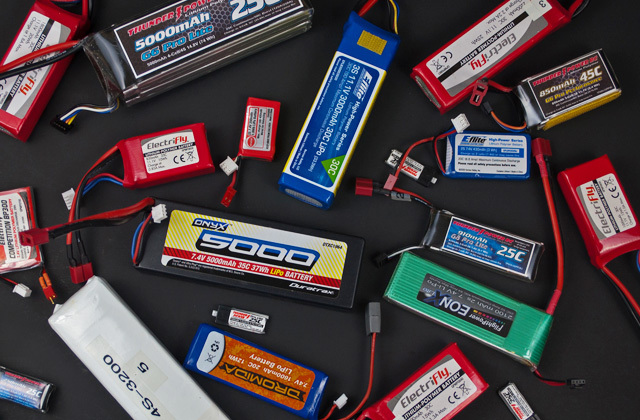 The absolute majority of them tend to be mechanical but there are a couple of models that run on batteries and offer a considerable boost in terms of firepower. 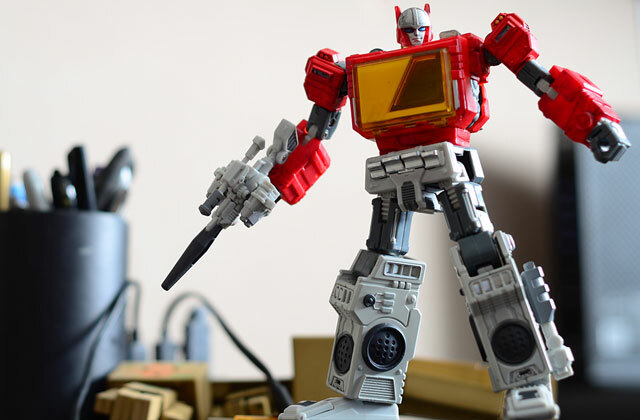 That said, if having a casual Nerf War session in the office doesn't sound like something that would interest you and you're simply looking for children's toy, we would suggest reading our reviews on lightsabers and transformer toys. 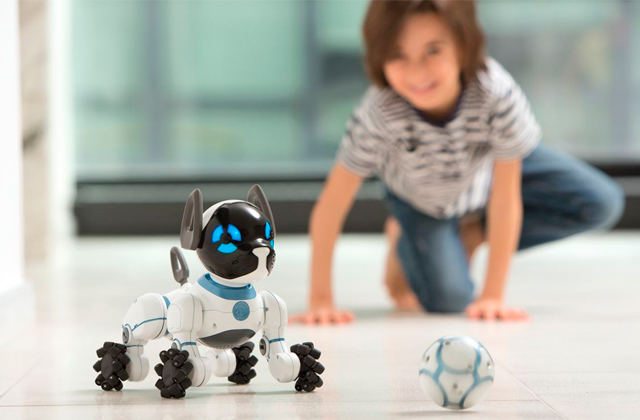 Best Remote Control Robots for Great Fun and Learning Experience!